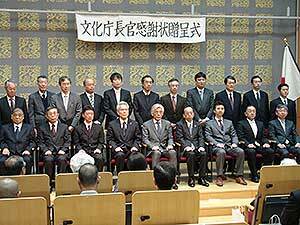 On March 25, 2013, an appreciation ceremony was held at the Institute’s Seminar Hall. 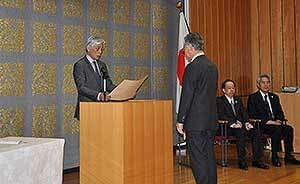 The ceremony honored individuals and organizations that cooperated with or were involved in efforts to rescue and restore cultural properties damaged by the Great East Japan Earthquake. KONDO Seiichi, Commissioner for Cultural Affairs, presented a certificate of appreciation to the Institute for its two years of service as Secretariat of the Committee for Salvaging Cultural Properties Affected by the 2011 Earthquake off the Pacific Coast of Tohoku and Related Disasters since April 2011. Four Visitors, including HANZAWA Shigenobu, former Chief Senior Specialist for Cultural Properties of the Agency for Cultural Affairs On March 8, four visitors, including HANZAWA Shigenobu, former Chief Senior Specialist for Cultural Properties of the Agency for Cultural Affairs, visited the Institute in order to observe Institute’s facilities. 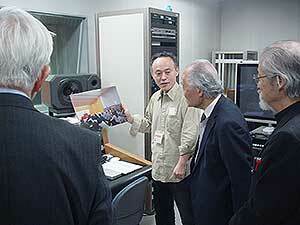 They toured the Library of the Department of Art Research, Archives, and Information Systems, the Performing Arts Recording Studio of the Department of Intangible Cultural Heritage, the Conservation Laboratory of the Center for Conservation Science and Restoration Techniques, and the Japan Center for International Cooperation in Conservation. The staff members in charge of each section explained the work they do. This spring, the Department of Art Research, Archives, and Information Systems published volume 6 of the Archive of Art Studies, entitled “YOKOYAMA Taikan’s Yamaji.” The Department of Art Research, Archives, and Information Systems started publishing the Archive of Art Studies in 2002. This volume summarizes the results of 3 years of research on YOKOYAMA Taikan’s Yamaji conducted jointly with Eisei Bunko. In the past, individual research reports were made available via the Institute’s website, but the full nature of that research has now been revealed to the public thanks to the cooperation of a number of individuals. Vol. 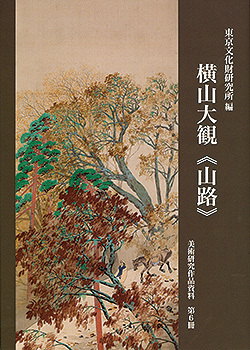 6 of the Archive of Art Studies features Yamaji (painted in 1911) in Eisei Bunko’s collection and a variant of that piece, Yamaji (painted in 1912), in the collection of the National Museum of Modern Art, Kyoto. This volume assembles information on the individual pieces based on their restoration and analysis of the pigments used as well as textual information regarding the pieces, such as critiques when they were presented and a description of their provenance. Reliable articles based on surveys of the pieces and other materials have been authored by ARAI Kei (Tokyo University of the Arts), OGAWA Ayako (Tokyo National Museum), SATO Shino (Yokoyama Taikan Memorial Hall), TAIRA Yuichiro (Tokyo University of the Arts), TAKEGAMI Yukihiro (Association for Conservation of National Treasures), NOJI Koichiro (Nerima Art Museum), HAYASHIDA Ryuta (Kumamoto Prefectural Museum of Arts), MIYAKE Hidekazu (Eisei Bunko), and SHIOYA Jun, who were involved in restoring and studying the pieces. Hopes are that this case study of research on a single work will, like previous volumes of the Archive of Art Studies, contribute to future studies of art history. Vol. 6 is available from Chuo Koron Bijutsu Shuppan. Please see the website below for details. 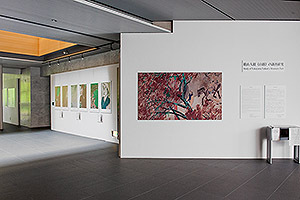 In conjunction with the publication of this volume, display boards describing Research on YOKOYAMA Taikan’s Yamaji were exhibited in the entrance lobby on the first floor of Institute starting on March 28. The display boards provide an overview of the research with a focus on images of Yamaji in Eisei Bunko’s collection (the same images are featured in Vol. 6). Thanks to high-resolution images taken by SHIRONO Seiji of the Institute, visitors to the Institute will be able to see for themselves the ingredients of the pigments used in Yamaji. There are two main schools of Kyogen, the Izumi and the Okura. 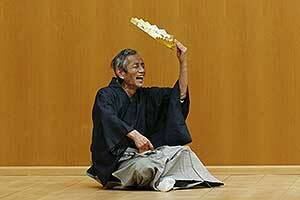 Kyogen performances and scripts of the two schools differ. In fact, traditions can differ even within the same school. There are three traditions within the Izumi school: Kyogen Kyodosha (Nagoya), the NOMURA Matasaburo Family (now residing in Nagoya), and the NOMURA Manzo and NOMURA Mansaku families (originally from Kanazawa). The Department of Intangible Cultural Heritage has studied Kyogen performances. As part of that research, SATO Tomohiko of Kyogen Kyodosha was recorded performing Hanago. Hanago is a piece primarily in the form of a ballad. Hanago is a naraimono, or a piece requiring special skills that one is not authorized to perform until reaching a certain age. The 2012 General Assembly of the Japan Consortium for International Cooperation in Cultural Heritage was convened on March 15th. The Secretariat General reported on Consortium projects in 2012 and projects planned for the coming year. This was followed by the 12th Seminar, which started with a keynote lecture by Jean Wee, Director, Preservation of Monuments Board, Ministry of Community, Culture, Youth and Sports, Singapore, entitled “International Cooperation-OMNI-Logue: Your voice is Mine.” Afterwards, four other lectures described recent trends in the safeguarding of cultural heritage with a focus on international conferences that mainly took place last year. FUTAGAMI Yoko, Head of the Research Information Section of the Department of Art Research, Archives, and Information Systems, National Research Institute for Cultural Properties, Tokyo, described deliberations concerning inscription of sites in accordance with the World Heritage Convention. Ms. FUTAGAMI also described inscription of a Palestinian site on the World Heritage List. NISHIBAYASHI Masuo, Ambassador in charge of Cultural Exchange and Ambassador in charge of Arctic Affairs, reported on the Closing event of the World Heritage Convention 40th Anniversary celebrations, held in Kyoto last year, and one of its outcomes, named Kyoto Vision. Mr. NISHI Kazuhiko, Associate Specialist for Cultural Properties of the Agency for Cultural Affairs, provided an overview of events in Toyama and Himeji held in conjunction with the celebrations’ Closing event. 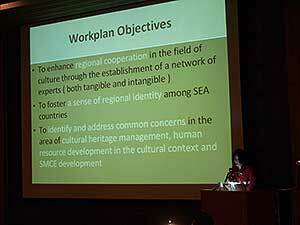 Mr. NISHI also described the Toyama Proposal on Heritage and Sustainable Development and the Himeji Recommendations. MIYATA Shigeyuki, Director of the Department of Intangible Cultural Heritage of the National Research Institute for Cultural Properties, Tokyo, reported on deliberations concerning inscription of files on the Representative List of the Intangible Cultural Heritage of Humanity. Mr. Miyata also mentioned recent remediation of the regional gap in inscriptions and conduct of the 7th Session of the Intergovernmental Committee for the Safeguarding of Intangible Cultural Heritage. The topic of international trends in protecting cultural heritage is usually brought up at seminars annually and attendees always number more than 50 people. Information on recent trends is greatly needed. The Japan Consortium for International Cooperation in Cultural Heritage will continue its efforts to share information through seminars .